Go to a required list in your SharePoint and switch to “Library” or “List” tab. 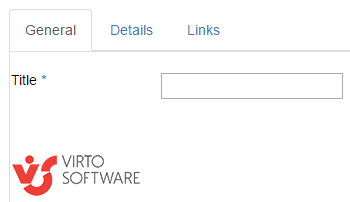 Click on Forms Designer icon on the ribbon. SharePoint Forms for Office 365 will be opened in the new window. In other words, you can create a form view for a folders structure or create a form view for list items in a SharePoint library. In the following examples the item form will be used. As an example, you can open edit form to start creating a new form for list items editing. 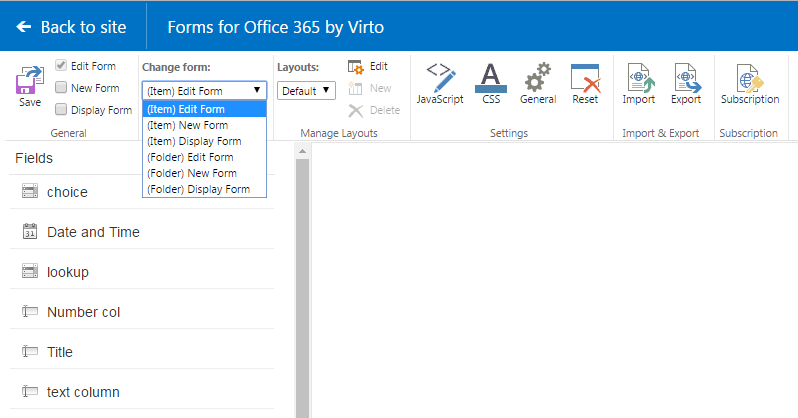 Actually, you can use any other default form view to start working with Virto SharePoint Forms for Office 365. All existing fields of the corresponding list are displayed on the top. Basic controls for SharePoint form creating are located below. Now you can design a SharePoint form, using drag and drop function. New section will appear on the form. In the right part you can define additional parameters of chosen controls. For example, you can type titles for both tabs, add new tab or adjust security settings. Also, you can make changes for fields. Choose text color, style and size to change its appearance. You can hide label text by unchecking box “Visibility”. 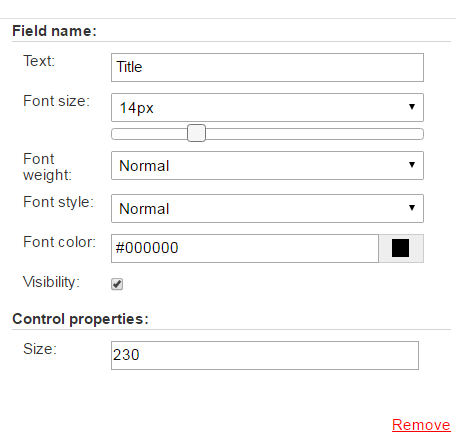 The control properties size function allows you to customize the field width. You can add any amount of sections and fields from the current list and place them in several rows under each other or locate 3 elements in a single row. You are able to locate in one row no more than 3 controls. 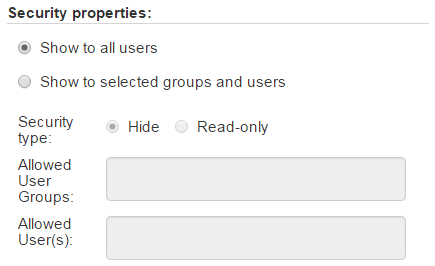 Remove chosen controls from your form by clicking “Remove” button or using drag and drop feature. Note: you can add any fields from the current list with no Read-only rights. Note: it is impossible to add fields of “Attachment” type. Note: fields from lists of “Document Library” types are not supported. Note: “Recurrence” and “All day event” fields from lists of “Calendar” type are not supported. 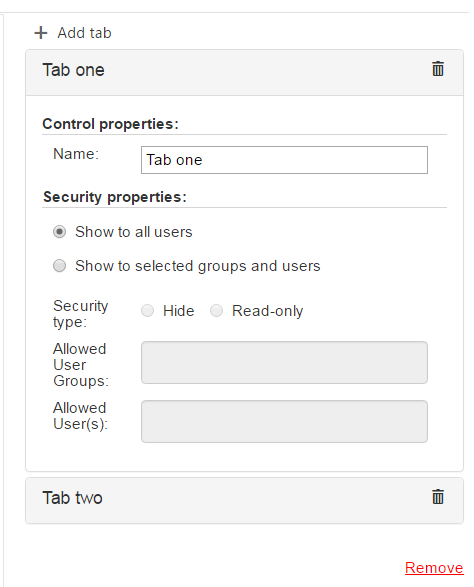 The element can be visible for all users or you can set custom permissions for limited list of allowed users or SharePoint groups. Note: If a tab or accordion section contains the required fields marked with *, this tab or accordion section with all fields is always visible for all users. However, you are able to set permissions to other sections or tabs of the same element and apply them to hide other fields. For example, section 1 with required field is visible, but section 2 can be hidden. You can create multiple tabs to optimize your SharePoint form view. 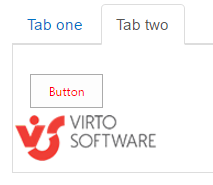 You can add more tabs by clicking “+ Add tab” button and type tab names in the control properties in the right corner. Remove the tab by clicking delete icon on the end of a chosen tab row. Delete all tabs by clicking on red “Remove” link. Then save changes to display created tabs. All tabs can contain any other controls, including other tabs and accordions. An accordion can contain any other controls, including other accordions and tabs. 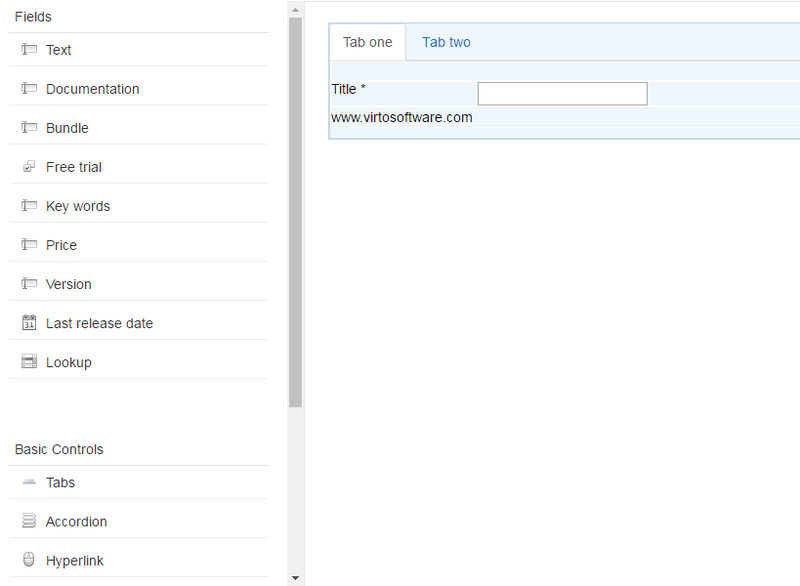 To add more accordions to existing form click “+ Add section”. Type new section name in the control properties. Remove the accordion section by clicking delete icon on the end of a chosen row. Delete all accordions by clicking on red “Remove” link. 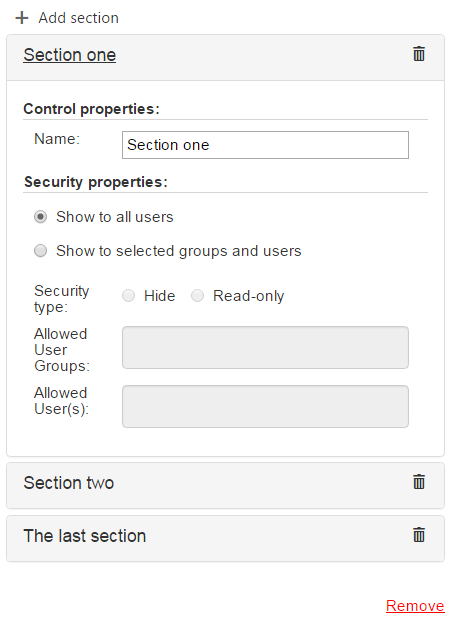 You are also able to define security permissions for accordion sections. 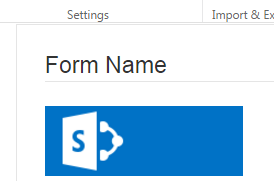 You are able to add links to your SharePoint Forms. Font size (optional). Choose text size from dropdown or with slider. Define font weight and style. 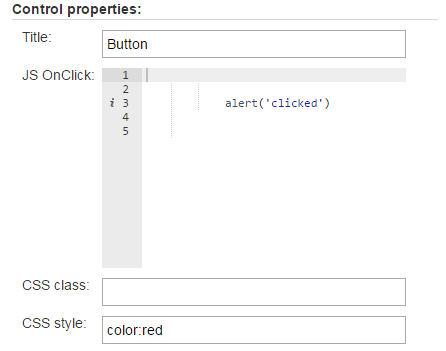 The button appearance can be also customized with css styles. 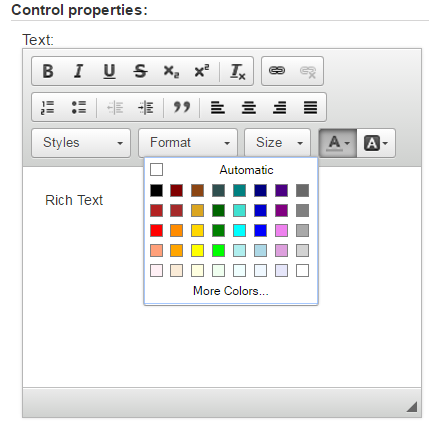 Type your text and optionally change its style rich text formatting. You can add a link to your text as well. 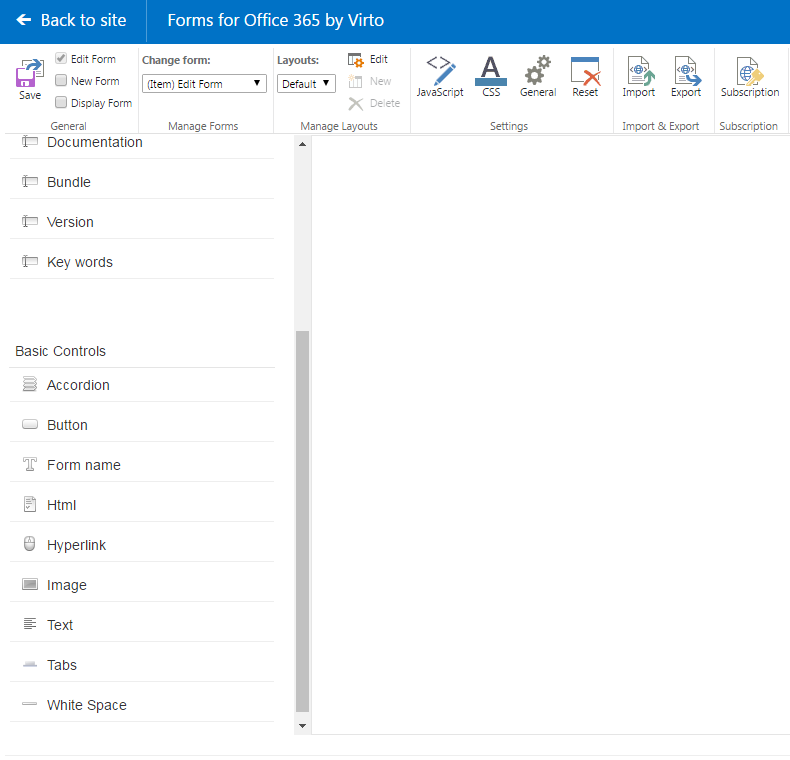 SharePoint Forms for Office 365 allows you to add images to your SharePoint form. You need to paste the image address in the “URL” field. Also, can add custom CSS styles to images. 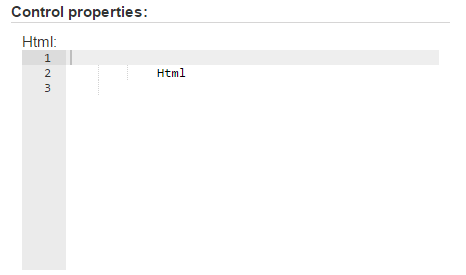 You can create in this field any interactive HTML-based controls. You can use this field to display form name or type any other header. Use this control to add empty space to your SharePoint Form. For example, if you need to divide some fields from others. 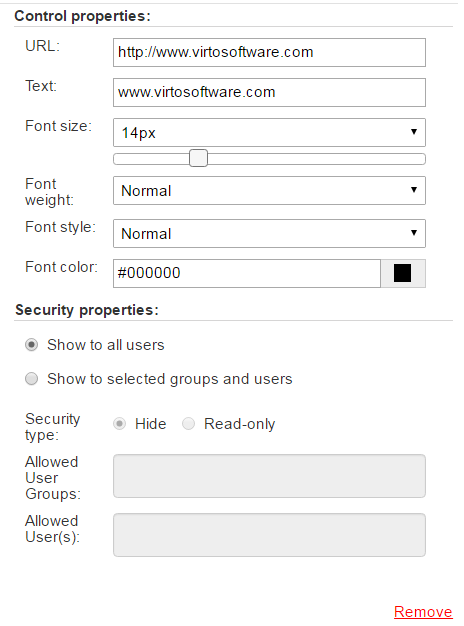 You are able to define white space size manually.